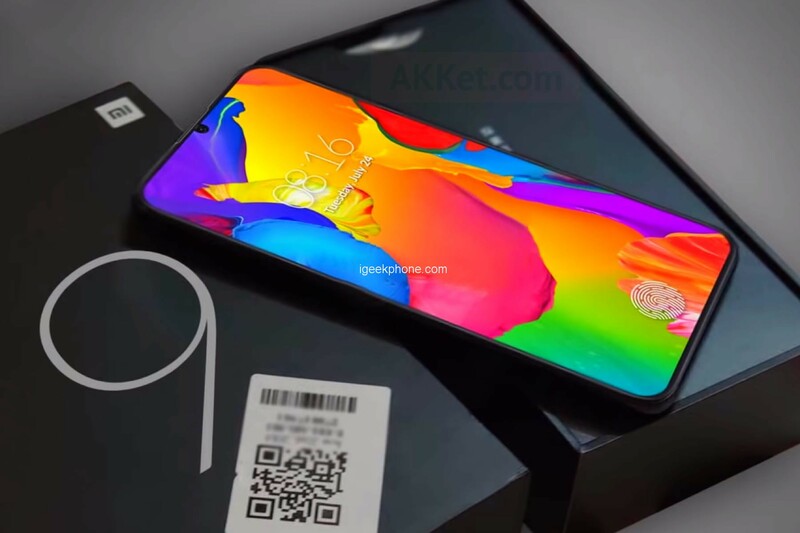 Xiaomi official has made it clear that Xiaomi Mi 9 will be Xiaomi’s next-generation flagship mobile phone. Previously, when creating the first new Phone Rice Note 7 of Xiaomi’s new independent brand Redmi, Lei Jun said that “Xiaomi Mi 9 fast charge will be better!” This is also the official confirmation of the existence of Xiaomi Mi 9 for the first time. Now, the full configuration information of Xiaomi Mi 9 on the product page of the foreign media website. Let’s take a look. According to foreign media Gsmarena news, Xiaomi Mi 9 will be equipped with a 6.4-inch Super 2OLED display with a resolution of 2280*1080, using Corning Gorilla Protected Glass (which generation is currently unknown), body measurements 155 x 75 x 7.6 Mm, from the product map given by the foreign media website, Xiaomi Mi 9’s chin, left and right border width control is ideal, the overall screen ratio is very high. 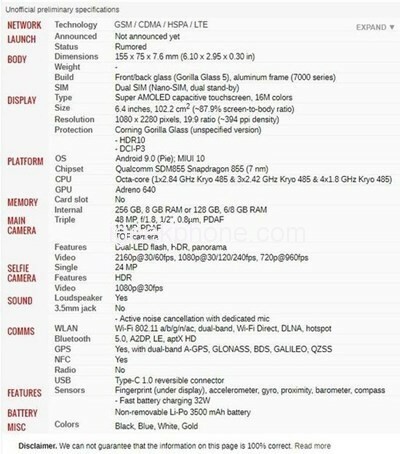 Core configuration, Xiaomi Mi 9 will be equipped with Qualcomm’s latest processor Snapdragon 855 processor, GPU with Adreno 640; body storage, Xiaomi Mi 9 will use 6/8GB +128GB/256GB storage configuration; in terms of camera, Xiaomi will use 48MP+12MP rear dual camera, equipped with dual LED flash, support HDR and panoramic, in video shooting, Xiaomi Mi 9 supports 960 frames slow motion shooting. In other respects, Xiaomi Mi 9 has a built-in 3500mAh lithium battery, supports dual-band A-GPS, supports screen fingerprint recognition, supports 32W fast charge, runs MIUI 10 based on Android 9; in addition, Xiaomi 9 will have black, blue, white, Four colors of gold. The above news is the news of foreign media, combed and reported in the first time, the current Xiaomi Mi 9 news from Xiaomi official is not much, the above news is for reference only, all subject to official news. Recently, a new model of the M1902F1T/A mill passed the 3C certification. The page shows that the model of the charger is MDY-10-EH, and the charging power is up to 27W. This point is in line with the fact that Lei Jun said that the Xiaomi Mi 9 fast charge must be better. It is worth noting that the model of Xiaomi Mi 8 is M1803E1T/A, and this model of 3C certified Xiaomi is M1902F1T/A, which is probably the Xiaomi Mi 9 that Xiaomi will release soon. This point is different from the 32W fast charge that the foreign media broke. The existing unofficial Xiaomi Mi 9 broke news, we still can not confirm the authenticity of this news, so there are still uncertainties in this news, and even do not rule out rumors.